Turmeric oil is obtained by steam distillation or solvent extraction of the powdered rhizome of species of the genus Curcuma (family: Zingiberaceae). Of these species, Curcuma longa is the most well known. 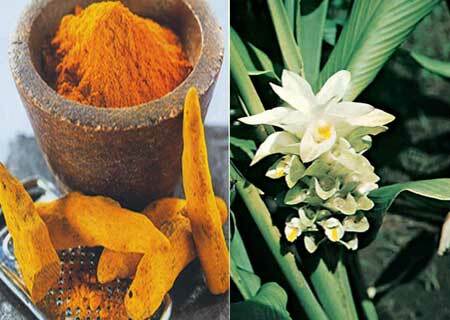 Curcuma longa yields 0.3-7.2% (usually 4-5%) of turmeric oil following steam distillation. The chief constituents of the essential oil are turmerone (60%) and related compounds, and zingiberene (25%). In India and other ayurvedic healing modality cultures, turmeric has long been known for its cosmetic and wound healing properties. The essential oil has been used as a perfume component and studies have shown that it has antibacterial/antifungal, anti-inflammatory and insect-repellant properties, and is effective in the treatment of scabies.